The Warrior range of specialist pallet trucks has been designed, developed and built to give outstanding long service with minimum maintenance required and assist with all manner of lifting, manoeuvring, pallet handling etc. within industry and commerce. A sound long term investment! 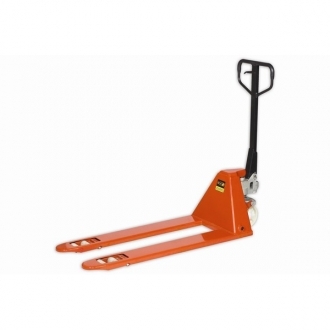 Manually operated and very easy to use, our 2000 kg capacity Low Profile Hand Pallet Truck is ideal for handling crates, American and Japanese pallets as well as standard pallets. The minimum lowered height is just 51 mm. The Low Profile also features tandem rollers, nylon steer wheels, an overload / pressure relief valve and greasing points for easy maintenance. Simple and easy to operate, lift is by means of a manually operated hydraulic pump unit and lowering is effected by a “deadmans” release trigger in the pulling handle.